Four years after the Tsunami , 150 families have the joy of moving into their own permanent home ( apartments built by the government ) . Credit must be given to those who designed and built the apartments. 3 blocks which came with 2 community halls equipped with a big kitchen ( this will make our cooking easy ) for big and small events. The housing development now called Nango Residents is built on a piece of land that used to be a school but was destroyed by the tsunami . We used to pray over the site during its construction about 2 years ago when we were staying in Kesennuma Hope Center located around the corner . 34 residents mainly elderlies came for the 2 hour party . 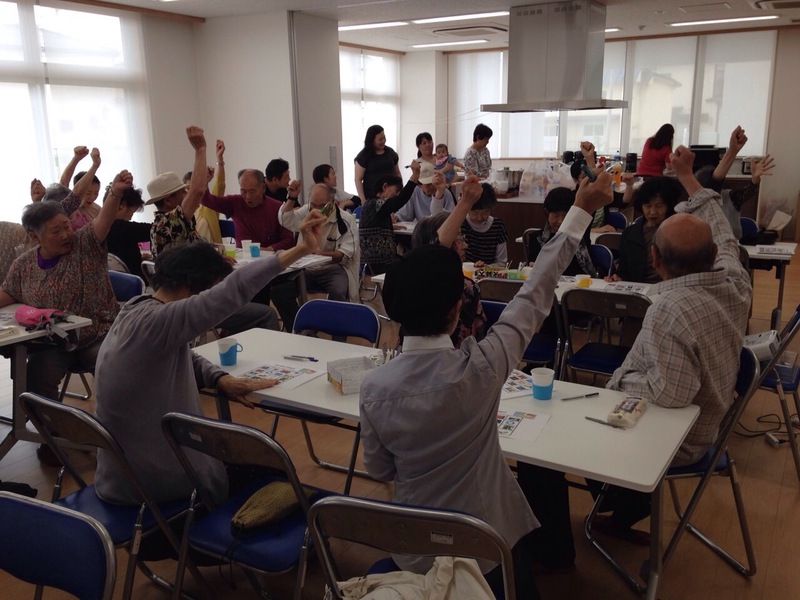 We started with physical exercises , then played Bingo game ,followed by singing and magic show . We served Singapore Chicken Curry with bread , gyoza ( chinese dumpling) and fruits . Every resident was given a simple gift pack consisting of soap and fruit. Judging from the response of the residents , we believe all of them have had a good time. What is satisfying to us is to see the smile on their faces and to have them interacting with one another. Interestingly the magician is a young 18 years old senior high school boy who is also a resident of Nango and is gifted in magic , having started magic since 10 years old . We invited them to the next event to be held at KFBBC on 26th July when we will host lunch after church service and serve our Singapore ‘s favorite food , probably Hainanese chicken rice .